1) LT needed a coat. 2) I needed some new shoes. 3) There’s a Cheesecake Factory there. Have you ever been to Cheesecake Factory, gentle reader? OHMYGOD It’s not just the desserts that are to die for. The food is amazing, too. And they have all of my favorite comfort foods like Shepherd’s Pie and Chicken & Dumplings. And then there’s the cheesecake. Of course there was a long line there. But they are of the enlightened school of restaurants that gives you a pager so you don’t have to sit right there waiting. LT and I went down the mall to The Walking Company because I can always find shoes there. I picked out several styles to try on, and the salesman went to the back to get them. Sales Guy came out with a pile of shoes for me to try on. And I brought these, he said, handing me a pair of thick, black socks. These are great socks and all of our customers love them. They’ll be great for winter. I already have great socks on, I said. LT said to Sales Guy You will not win this battle. What kind of socks do you have? Sales Guy asked. I could see him preparing to debate. 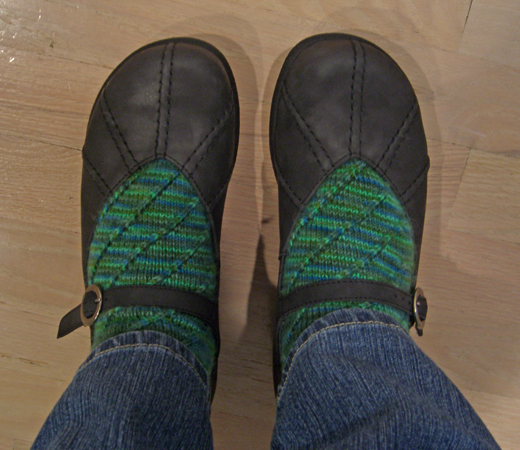 Ones I knit myself, I answered, kicking off my clogs. I was wearing my Waffles With Brown Sugar socks — probably the brightest pair that I own. Sales Guy’s eyes got bigger, but his face registered defeat. Well, OK! he said. The thick, black socks disappeared discretely. And, OK… I’ll admit it. Not much sock knitting was accomplished this weekend. But I have a good excuse! I spent a lot of time getting ready for the next sock class, which starts in a little over a week. And I tried to get caught up on a few things around the house, like laundry and bills. And I swatched for a sweater. I know what you’re thinking, gentle reader. Doesn’t she have enough projects going already? Well… one might think so. But, hey… the yarn called. Actually, the yarn did call. It’s Trendsetter Yarns Fatigues in color #13 – Khaki. It’s kind of a strange yarn, but it knits up nicely. I’ve been eying it for a long time, ever since it came in, thinking it would be great for a casual sweater if I could find just the right pattern. Well, I found the pattern — the basket weave henley sweater from The Purl Stitch. The yarn has been discontinued – I guess other knitters couldn’t figure out what to do with it, either – so I thought I should strike while I could still get the stuff. So I swatched. So sue me. #1 Son called yesterday from Florida. Today they are headed for Georgia. He does get around, eh?